Kolab Now was first launched January 2013 and we were anxious to find out: If someone offered a public cloud service for people that put their privacy and security first. A service that would not just re-sell someone else’s platform with some added marketing, but did things right. Would there be a demand for it? Would people choose to pay with money instead of their privacy and data? These past two and a half years have provided a very clear answer. Demand for a secure and private collaboration platform has grown in ways we could have only hoped for. To stay ahead of demand we have undertaken a significant upgrade to our hosted solution that will allow us to provide reliable service to our community of users both today and in the years to come. This is the most significant set of changes we’ve ever made to the service, which have been months in the making. We are very excited to unveil these improvements to the world as we complete the roll-out in the coming weeks. Assumptions are the root of all evil. Yet in the absence of knowledge of the future, sometimes informed assumptions need to be made. And sometimes the world just changes. It was February 2013 when MyKolab was launched into public beta. Our expectation was that a public cloud service oriented on full business collaboration focusing on privacy and security would primarily attract small and medium enterprises between 10 and 200 users. Others would largely elect to use the available standard domains. So we expected most domains to be in the 30 users realm, and a handful of very large ones. That had implications for the way the directory service was set up. In order to provide the strongest possible insulation between tenants, each domain would exist in its own zone within the directory service. You can think of this as o dedicated installations on shared infrastructure instead of the single domain public clouds that are the default in most cases. Or, to use a slightly less technical analogies, between serial houses or apartments in a large apartment block. So we expected some moderate growth for which we planned to deploy some older hardware to provide adequate redundancy and resource so there would be a steady show-case for how to deploy Kolab into the needs of Application and Internet Service Providers (ASP/ISP). Literally on the very day when we carried that hardware into the data centre did Edward Snowden and his revelations become visible to the world. It is a common quip that assumptions and strategies usually do not outlive their contact with reality. Ours did not even make it that far. After nice, steady growth during the early months, MyKolab.com took us on a wild ride. Our operations managed to work miracles with the old hardware in ways that often made me think this would be interesting learning material for future administrators. But efficiency only gets you so far. Within a couple of months however we ended up replacing it in its entirety. And to the largest extent all of this was happening without disruption to the production systems. New hardware was installed, services switched over, old hardware removed, and our team also managed to add a couple of urgently sought features to Kolab and deploy them onto MyKolab.com as well. What we did not manage to make time for is re-work the directory service in order to adjust some of the underlying assumptions to reality. Especially the number of domains in relation to the number of users ended up dramatically different from what we initially expected. The result of that is a situation where the directory service has become the bottleneck for the entire installation – with a complete restart easily taking in the realm of 45 minutes. In addition, that degree of separation translated to more restrictions of sharing data with other users, sometimes to an extent that users felt this was lack of a feature, not a feature in and of itself. Re-designing the directory service however carries implications for the entire service structure, including also the user self-administration software and much more. And you want to be able to deploy this within a reasonable time interval and ensure the service comes back up better than before for all users. So there is the re-design, the adaptation of all components, the testing, the migration planning, the migration testing and ultimately also the actual roll-out of the changes. That’s a lot of work. Most of which has been done by this point in time. The last remaining piece of the puzzle was to increase hardware capacity in order to ensure there is enough reserve to build up an entire new installation next to existing production systems, and then switch over, confirm successful switching, and then ultimately retire the old setup. That hardware has been installed last week. So now the roll-out process will go through the stages and likely complete some time in September. That’s also the time when we can finally start adding some features we’ve been holding back to ensure we can re-adjust our assumptions to the realities we encountered. For all users of Kolab Now that means you can look forward to a much improved service resilience and robustness, along with even faster turnaround times on technical issues, and an autumn of added features, including some long-sought improvements many of you have been asking for. 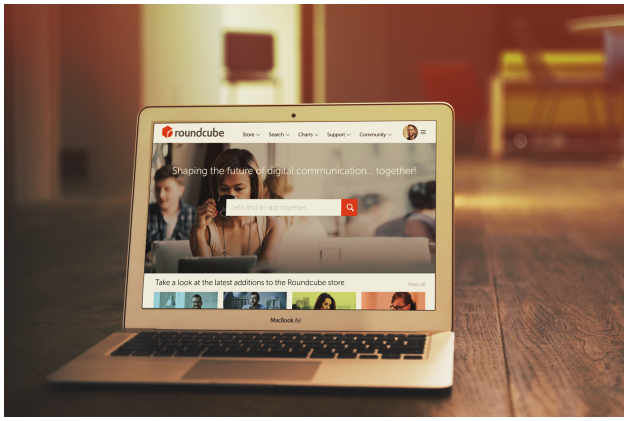 Bringing together an alliance that will liberate our future web and mobile collaboration was the most important motive behind our launching the Roundcube Next campaign at the 2015 Kolab Summit. This goal we reached fully. The second objective for the campaign was to get enough acceleration to be able to allow two, three people to focus on Roundcube Next over the coming year. That goal we reached partially. There is enough to get us started and go through the groundwork, but not enough for all the bells and whistles we would have loved to go for. To a large extent that’s because we would have a lot of fantasy for bells and whistles. But perhaps it is a good thing that the campaign did not complete all the way into the stretch goals. So by the time the money was in our PayPal account, we are down 8.15%. The reason for that is simple: Instead of transferring the complete amount in one transaction, which would have incurred only a single transaction fee, they transferred it individually per contribution. Which means PayPal gets to extract the per transaction fee. I assume the rationale behind this is that PayPal may have acted as the escrow service and would have credited users back in case the campaign goal had not been reached. Given our transactions were larger than average for crowd funding campaigns, the percentage for other campaigns is likely going to be higher. It would seem this can even go easily beyond the 5% that you see quoted on a variety of sites about crowd funding. But it does not stop there. Indiegogo did not allow to run the campaign in Swiss Franc, and PayPal forces transfers into our primary currency, resulting in another fee for conversion. On the day the Roundcube Next Campaign funds were transferred to PayPal, XE.com lists the exchange rate as 0.9464749579 CHF per USD. 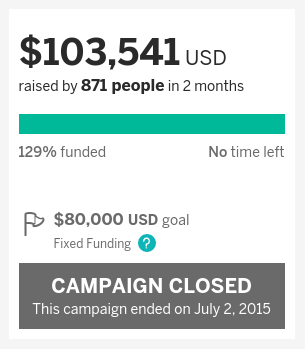 So now we’re at 10.39% in fees, of which 4% go to Indiegogo for their services. A total of 6.39% went to PayPal. Not to mention this is before any t-shirt is printed or shipped, and there is of course also cost involved in creating and running a campaign. The $4,141.64 we paid to Indiegogo are not too bad, I guess. Although their service was shaky and their support non-existent. I don’t think we ever got a response to our repeated support inquiries over a couple of weeks. And we experienced multiple downtimes of several hours which were particularly annoying during the critical final week of the campaign where we can be sure to have lost contributions. PayPal’s overhead was $6,616.27 – the equivalent of another Advisor to the Roundcube Next Campaign. That’s almost 60% more than the cost for Indiegogo. Which seems excessive and is reminding me of one of Bertolt Brecht’s more famous quotes. But of course you also need to add the effort for the campaign itself, including preparation, running and perks. Considering that, I am no longer surprised that many of the campaigns I see appear to be marketing instruments to sell existing products that are about to be released, and less focused on innovation. 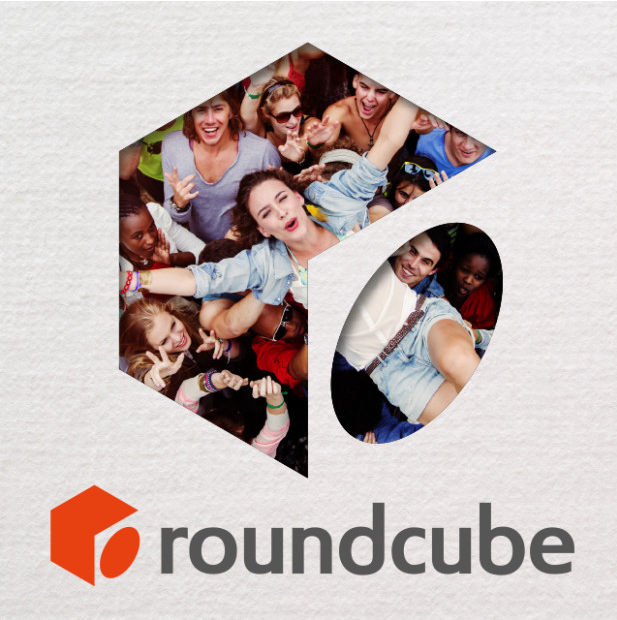 In any case, Roundcube Next is going to be all about innovation. And Kolab Systems will continue contribute plenty of its own resources as we have been doing for Roundcube and Roundcube Next, including a world class Creative Director and UI/UX expert who is going to join us in a month from now. We also remain open to others to come aboard. The advisory group is starting to constitute itself now, and will be taking some decisions about requirements and underlying architecture. Development will then begin and continue up until well into next year. So there is time to engage even in the future. But many decisions will be made in the first months, and you can still be part of that as Advisor to Roundcube Next. It’s not too late to be part of the Next. Just drop a message to contact@kolabsystems.com. Software is a social endeavour. The most important advantage of Free Software is its community. Because the best Open Source is built by a community of contributors. Contribution being the single most important currency and differentiation between users and community. You want to be part of that community at least by proxy because like any community, members of our community spend time together, exchange ideas, and create cohesion that translates into innovation, features, best practices. We create nothing less than a common vision of the future. By the rules of our community, anyone can take our software and use it, extend it, distribute it. A lot of value can be created this way and not everyone has the capabilities to contribute. Others choose not to contribute in order to maximise their personal profits. Short of actively harming others, egoism, even in its most extreme forms, is to be accepted. That is not to say it is necessarily a good idea for you to put the safeguarding of your own personal interests into the hands of an extreme egoist. Or that you should trust in their going the extra mile for you in all the places that you cannot verify. That is why the most important lesson for non-developers is this: Choose providers based on community participation. Not only are they more likely to know early about problems, putting them in a much better position to provide you with the security you require. They will also ensure you will have a future you like. Developers know all this already, of course, and typically apply it at least subconsciously. 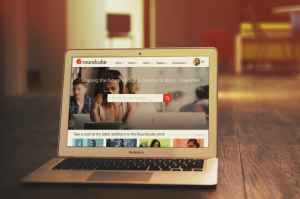 Growing that kind of community has been one of the key motives to launch Roundcube Next, which is now coming close to closing its phase of bringing together its key contributors. Naturally everyone had good reasons to get involved, as recently covered on Venturebeat. Last night Sandstorm.io became the single greatest contributor to the campaign in order to build that better future together, for everyone. Over the past weeks, many other companies, some big, some small, have done the same. Together, we will be that community that will build the future. If you are a user of Roundcube, you want to contribute to roundcu.be/next. If you are a provider of services, you definitely want to get engaged and join the advisory group. Here is why. Free Software has won. Or has it? 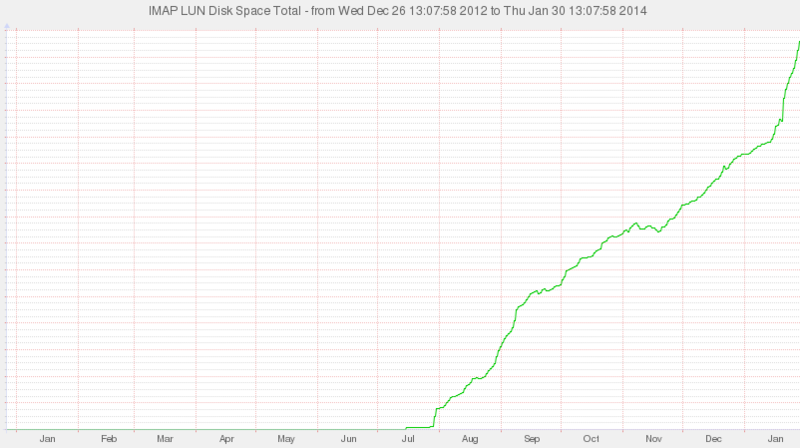 Linux is certainly dominant on the internet. Every activated Android device is another Linux kernel running. At the same time we see a shift towards “dumber” devices which are in many ways more like thin clients of the past. Only they are not connected to your own infrastructure. Alerted by the success of Google Apps, Microsoft has launched Office 365 to drive its own transformation from a software vendor into a cloud provider. Amazon and others have also joined the race to provide your collaboration platform. The pull of these providers is already enormous. Thanks to networking effects, economies of scale, and ability to leverage deliberate technical incompatibilities to their advantage, the drawing power of these providers is only going to increase. Open Source has managed to catch up to the large providers in most functions, bypassing them in some, being slightly behind in others. Kolab has been essential in providing this alternative especially where cloud based services are concerned. Its web application is on par with Office 365 and Google Apps in usability, attractiveness and most functions. Its web application is the only fully Open Source alternative that offers scalability to millions of users and allows sharing of all data types in ways that are superior to what the proprietary competition has to offer. 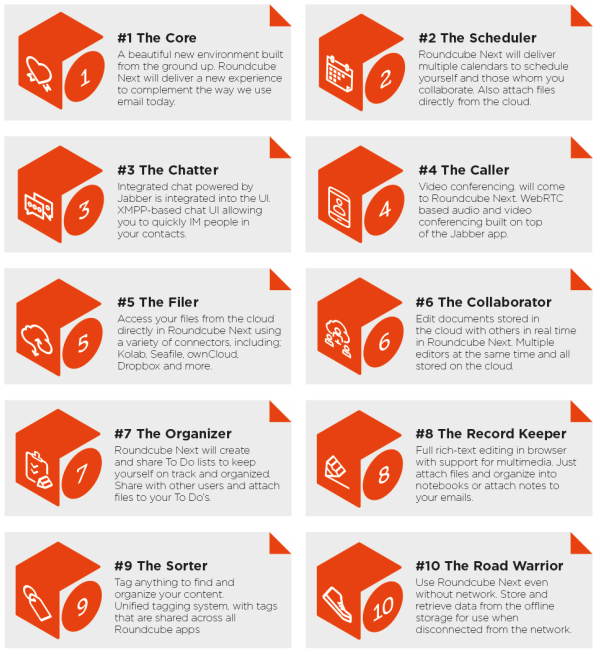 Collaborative editing, chat, voice, video – all the forms of synchronous collaboration – are next and will be added incrementally. Just as Kolab Systems will keep driving the commercial ecosystem around the solution, allowing application service providers (ASP), institutions and users to run their own services with full professional support. And all parts of Kolab will remain Free and Open, as well as committed to the upstream, according to best Free Software principles. If you want to know what that means, please take a look at Thomas Brüderlis account of how Kolab Systems contributes to Roundcube. 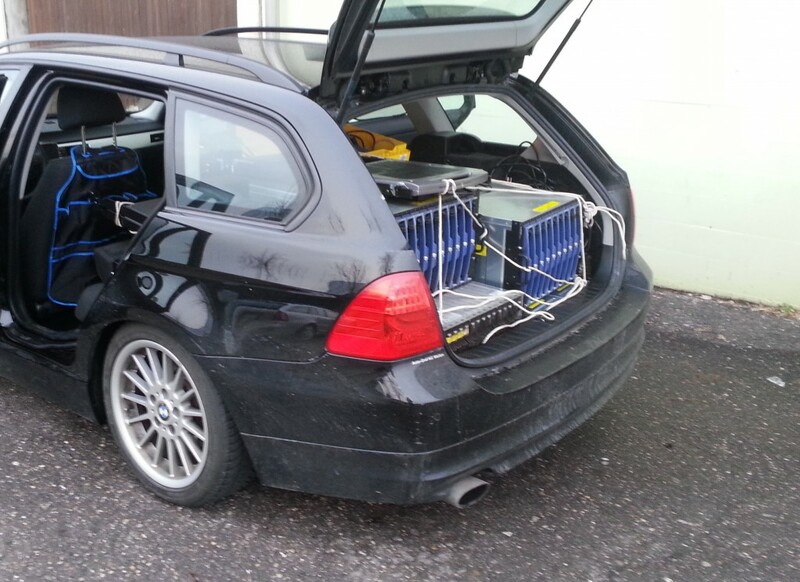 TL;DR: Around 2009, Roundcube founder Thomas Brüderli got contacted by Kolab at a time when his day job left him so little time to work on Roundcube that he had played with the thought of just stepping back. Kolab Systems hired the primary developers of Roundcube to finish the project, contributing in the area of 95% of all code in all releases since 0.6, driving it its 1.0 release and beyond. 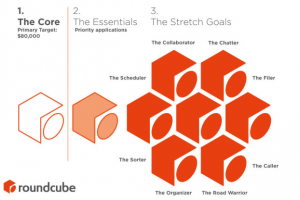 At the same time, Kolab Systems carefully avoided to impose itself on the Roundcube project itself. From a Kolab perspective, Roundcube is the web mail component of its web application. The way we pursued its development made sure that it could be used by any other service provider or ISV. And it was. Roundcube has an enormous adoption rate with millions of downloads, hundreds of thousands of sites and an uncounted number beyond the tens of millions. According to cPanel, 62% of their users choose Roundcube as their web mail application. It’s been used in a wide number of other applications, including several service providers that offer mail services that are more robust against commercial and governmental spying. Everyone at Kolab considers this a great success, and finds it rewarding to see our technology contribute essential value to society in so many different ways. But while adoption sky-rocketed, contribution did not grow in the same way. It’s still Kolab Systems driving the vast majority of all code development in Roundcube along with a small number of occasional contributors. And as a direct result of the Snowden revelations the development of web collaboration solutions fragmented further. There are a number of proprietary approaches, which should be self-evidently disqualified from being taken serious based on what we have learned about how solutions get compromised. But there are also Open Source solutions. The Free Software community has largely responded in one of two ways. Many people felt re-enforced in their opinion that people just “should not use the cloud.” Many others declared self-hosting the universal answer to everything, and started to focus on developing solutions for the crypto-hermit. The problem with that is that it takes an all or nothing approach to privacy and security. It also requires users to become more technical than most of them ever wanted to be, and give up features, convenience and ease of use as a price for privacy and security. In my view that ignores the most fundamental lesson we have learned about security throughout the past decades. People will work around security when they consider it necessary in order to get the job done. So the adoption rate of such technologies will necessarily remain limited to a very small group of users whose concerns are unusually strong. These groups are often more exposed, more endangered, and more in need of protection and contribute to society in an unusually large way. So developing technology they can use is clearly a good thing. It just won’t solve the problem at scale. To do that we would need a generic web application geared towards all of tomorrow’s form factors and devices. It should be collaboration centric and allow deployment in environments from a single to hundreds of millions of users. It should enable meshed collaboration between sites, be fun to use, elegant, beautiful and provide security in a way that does not get into the users face. Fully Free Software, that solution should be the generic collaboration application that could become in parts or as a whole the basis for solutions such as mailpile, which focus on local machine installations using extensive cryptography, intermediate solutions such as Mail-in-a-Box, all the way to generic cloud services by providers such as cPanel or Tucows. It should integrate all forms of on-line collaboration, make use of all the advances in usability for encryption, and be able to grow as technology advances further. 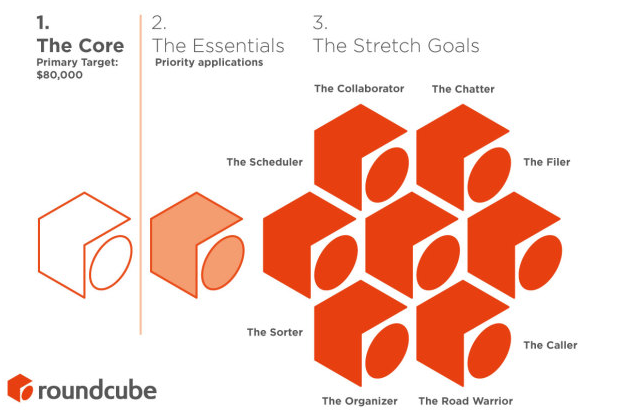 That, in short, is the goal Kolab Systems has set out to achieve with its plans for Roundcube Next. While we can and of course will pursue that goal independently in incremental steps we believe that would be missing two rather major opportunities. Such as the opportunity to tackle this together, as a community. We have a lot of experience, a great UI/UX designer excited about the project, and many good ideas. But we are not omniscient and we also want to use this opportunity to achieve what Roundcube 1.0 has not quite managed to accomplish: To build an active, multi-vendor community around a base technology that will be fully Open Source/Free Software and will address the collaborative web application need so well that it puts Google Apps and Office 365 to shame and provides that solution to everyone. And secondly, while incremental improvements are immensely powerful, sometimes leapfrogging innovation is what you really want. All of that is what Roundcube Next really represents: The invitation to leapfrog all existing applications, as a community. So if you are a user that has appreciated Roundcube in the past, or a user who would like to be able to choose fully featured services that leave nothing to be desired but do not compromise your privacy and security, please contribute to pushing the fast forward button on Roundcube Next. And if you are an Application Service Provider, but your name is not Google, Microsoft, Amazon or Apple, Roundcube Next represents the small, strategic investment that might just put you in a position to remain competitive in the future. Become part of the advisory group and join the ongoing discussion about where to take that application, and how to make it reality, together. Information Technology is a hype driven industry, a fact that has largely contributed to the current situation where the NSA and GCHQ have unprecedented access to the global communication and information. Including for a very Realpolitik based approach to how that information may be used. Economic and political manipulation may not be how these measures are advertised, but it may very well be the actual motivation. It’s the economy, stupid! Ever since all of this started, many people have asked the question how to protect their privacy. Despite some there is still a lack of comprehensive answers to this question. There is an obvious answer that most mainstream media seem to have largely missed: Software freedom advocates had it right all along. 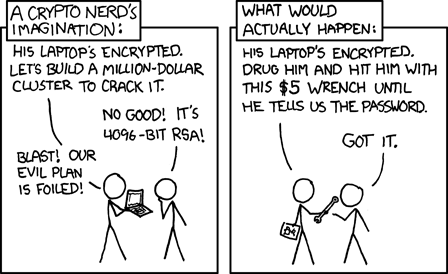 You cannot trust proprietary cryptography, or proprietary software. If a company has a connection to the legal nexus of the United States, it is subject to US law and must comply with demands of the NSA and other authorities. But if that company also provides proprietary software it is virtually impossible for you to know what kind of agreements it has with the NSA, as most of their management prefer not to go to jail. But one would have to be very naive to think the United States is the only country where secret agreements exist. One of the most singular characteristics of the art of deciphering is the strong conviction possessed by every person, even moderately acquainted with it, that he is able to construct a cipher which nobody else can decipher. “So you were right, good for you” I hear you think. The point I am trying to make is a different one. It has been unbelievably difficult in the past to consequently do the right thing that would now give us the answers to the questions posed by the NSA and others. Both the Free Software Foundation Europe (FSFE) as an organisation and Kolab as a technology have a very long history to that extent. In fact if you’ve read the background of MyKolab.com, you’ll hopefully see the same kind of approach there, as well. Having been involved with both has given me a unique perspective. So when Bruce Schneier is listing GnuPG as the first of several applications he is using and recommending to stay secure, I can’t help but find this rather ironic and rewarding at the same time. Because I know what has been necessary for this crucial piece of software to come so far. Especially Werner Koch, but also Markus Brinkmann are two people all of us are indebted to, even though most people don’t realize it. Excellent software developers, but entrepreneurs with much room for improvement and (I’m sorry, guys) horrible at marketing and fundraising. So they pretty much exploited themselves over many years in order to be able to keep the development going because they knew their work was essential. Over the course of the past 12 years the entire Kolab team and especially individuals such as Bernhard Reiter at Intevation have always done what they could to involve them in development projects and push forward the technology. And we will continue to do that, both through MyKolab.com and some other development projects we are pushing with Kolab Systems for customers that have an interest in these technologies. But they have a whole lot more in mind than we could make possible immediately, such as dramatically increasing the usability for end-to-end cryptography. The concept they have developed is based on over a decade of working on obstacles to end user adoption. It’s called STEED — Usable End-to-End Encryption and has been available for two years now. I think it’s time to be finalized and implemented. That’s why I am using tomorrow’s Software Freedom Day to ask for volunteers to help them run a crowdfunding campaign so they can finally put it into practice, in the open, to everyone’s benefit. Because that’s going to contribute more than just a little bit towards a world where privacy will once more be the default. So please help spread the word and let the STEED run! It’s hard to overestimate the role that Groklaw has played in the past years. Many of us, myself included, have worked with Groklaw over the years. I still take pride my article about the dangers of OOXML for Free Software and Open Standards might have been the first of many calls to arms on this topic. Or how Groklaw followed the Microsoft antitrust case that FSFE fought for and with the Samba team, and won for all of software freedom. Groklaw was essential in helping us counter some of the Microsoft spin-doctoring. Or the Sean Daly interview with Volker Lendecke, Jeremy Allison, Carlo Piana and myself for Groklaw after the landslide victory against Microsoft in court. I remember very well how giddy I still was during the interview for having realized that Microsoft would not be able to take down FSFE, because that would have been the consequence had they gotten their way. We bet our life’s work at the time. And won. The relief was incredible. And it’s true. Groklaw has been the most important platform to counter corporate spin doctoring, has practiced an important form of whistleblowing long before Wikileaks, and has been giving alternative and background perspective on some of the most important things going on inside and outside the media limelight. without Groklaw, all of us will lack that essential information. So firstly, I’d like to thank PJ for all the hard years of work on Groklaw. Never having had the pleasure of meeting her in real life, I still feel that I know her from the conversations we had over email over so many years. And I know how she got weary of the pressure, the death threats and the attempts at intimidating her into silence. Thank you for putting up with it for so long, and for doing what you felt was right and necessary despite the personal cost to yourself! The world needs more people like you. But with email having been the only channel of communication she was comfortable using for reasons of personal safety, when Edward Snowden revealed the PRISM program, when Lavabit and Silent Circle shut down, when the boyfriends of journalists get detained at Heathrow, she apparently drew the conclusion this was no longer good enough to protect her own safety and the safety of the people she was in communication with. That she chose MyKolab.com as the service to confide in with her remaining communication lines at least to me confirms that we did the right thing when we launched MyKolab.com and also that we did the right thing in the way we did it. But it cannot mitigate the feeling of loss for seeing Groklaw fall victim to the totalitarian tendencies our societies are exhibiting and apparently willingly embracing over the past years. While we’re happy to provide a privacy asylum in a safe legislation, society should not need them. Privacy should be the default, not the exception. In January this year we started the MyKolab beta phase and last week we finally moved it to its production environment, just in time for the Swiss national day. This seemed oddly fitting since the Swiss national day celebrates its independence and self-determination, as they were liberating themselves from the feudal system. So when Bruce Schneier wrote about how the Internet right now resembles a feudal system, it was too tempting an opportunity to miss. And of course PRISM and Tempora played their part in the timing, as well, although we obviously had no idea this leak was coming when we started the beta in January. Anyhow. So now MyKolab.com has its new home. It should be highlighted that we actually run this on our own hardware, in a trustworthy, secure data centre, in a rack which we physically control. 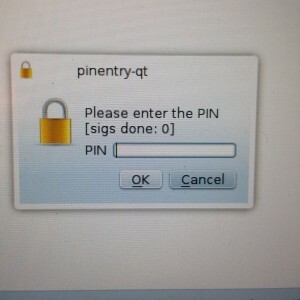 Because that is where security starts, really. Also, we run this in Switzerland, with a Swiss company, and for a reason. Most people do not seem to realize the level of protection data enjoys in Switzerland. We tried to explain it in the FAQ, and the privacy information. But it seems that too many people still don’t get it. Put frankly, in these matters, legislation trumps technology and even cryptography. Because when push comes to shove, people would rather not go to jail. So no matter what snake oil someone may be trying to sell you about your data being secure because “it is encrypted on our server with your passphrase, so even we don’t have access” – choice of country and legislation trumps it all. As long as server-side cryptography is involved a provider can of course access your data even when it is encrypted. Especially when the secret is as simple as your password which all your devices submit to the server every time you check mail. Better yet, when you have push activated, your devices even keep the connection open. And if the provider happens to be subject to a requirement to cooperate and hand over your data, of course they will. Quite often they don’t even necessarily know that this is going on if they do not control the physical machines. So whenever someone tries to serve you that kind of snake oil, you should avoid that service at all cost, because you do not know which lies you are not catching them in the act with. And yes, it is a true example, unfortunately. The romantic picture of the internet as a third place above nation states has never had much evidence on its side. Whoever was harbouring these notions and missed XKCDs take on the matter should definitely have received their wakeup call by Lavabit and Silent Circle. Country and applicable legislation always win. So legislation, hardware. What else? Terms of Service come to mind. Too often they are deliberately written to obfuscate or frankly turn you into the product. Because writing software, buying hardware, physical security, maintaining systems, staffing help desks, electricity: All these things cost money. If you do not pay for it, make sure you know who does. Because otherwise it’s like this old poker adage: If you cannot tell who is the weakest player at the table, it’s you. Likewise for any on-line service: if you cannot tell who is paying for this, it’s probably you. Sometimes this may just in ways you did not expect, or may not have been aware of. So while most people only look for the lowest price, the question you actually should be asking yourself is: Am I paying enough for this service that I think it can be profitable even when it does everything right and pays all its employees fairly even if they have families and perhaps even mortgages? The alternative are services that are run by enthusiasts for the common good, or subsidized by third parties – sometimes for marketing purposes. If it is run by an enthusiast, the question is how long they can afford to run this service well, and what will happen if their priorities or interests change. Plus few enthusiasts are willing to dish out the kind of cash that comes with a physically controlled, secure system in a data centre. So more often than not, this is either a box in someone’s basement where pretty much anyone has access while they go out for a pizza or cinema, or – at least as problematic – a cheap VM at some provider with unknown physical, legislative and technical security. If it is a subsidized service, it’s worse. Just like subsidies on food in Europe destroy the farming economy in Africa, making almost a whole continent dependent on charity, subsidized services cannibalize those that are run for professional interest. In this case that means they damage the professional development community around Open Source, leading to less Free Software being developed. Why is that? Because such subsidized services typically do not bother with contributing upstream – which is a pure cost factor and this is already charity, so no-one feels there is a problem not to support the upstream – and they are destroying the value proposition of those services that contribute upstream. So the developers of the upstream technologies need to find other ways to support their work on Open Source, which typically means they get to spend less time on Free Software development. This is the well-meaning counterpart to providers who simply take the software, do not bother to contribute upstream, but use it to provide a commercial service that near-automatically comes in below the price if you were to price it sustainably by factoring in the upstream contribution and ongoing development. The road to hell and all that. None of this is anything we wanted to contribute to with MyKolab.com. So we made sure to write Terms of Service that were as good, honest and clear as we could make them, discussed them with the people behind the important Terms of Service; Didn’t Read project, and even link to that project from our own Terms of Service so people have a fair chance to compare them without being lawyers or even reading them. We also were careful to not choose a pricing point that would cannibalize anything but proprietary software. Because we pay the developers. All of who write Open Source exclusively. This has made sure that we have been the largest main contributor to the Roundcube web mailer by some margin, for instance. In doing so, we deliberately made sure to keep the project independent and did not interfere with its internal management. Feel free to read the account of Thomas Brüderli on that front. So while hundreds of thousands of sites use Roundcube world wide, and it is popular with millions of users, only a handful of companies bother to contribute to its development, and none as much as Kolab Systems AG, which is the largest contributor by orders of magnitude. Don’t get me wrong. That’s all fine. We are happy about everyone who makes use of the software we develop, and we firmly believe there is a greater good achieved through Free Software. But the economics are nonetheless the same: The developers working on Roundcube have lives, families even, monthly bills to pay, and we pay them every month to continue working on the technology for everyone’s good. Within our company group, similar things can probably be said for more than 60 people. And of course there are other parts of our stack that we do not contribute as much to, in some cases we are primarily the beneficiary of others doing the same. It’s a give and take among companies who operate in this way that works extremely well. But there are some who almost never contribute. And if, as a customer, you choose them over those that are part of the developer community, you are choosing to have less Open Source Software developed. So looking at contribution to Free Software as one essential criterion for whether the company you are about to choose is acting sustainably or trying to work towards a tragedy of the commons is something I would certainly suggest you do. and you want to make sure you pay enough for all of these to meet the criteria you expect. On all these counts simultaneously, we made sure to put MyKolab.com into the top 10%. Perhaps even the top 5%, because we develop, maintain and publish the entire stack, as a solution, fully Open Source and more radically Open Standards based than any other solution in this area. So in fact you never need to rely upon MyKolab.com continuing to provide the service you want. You can always continue to use the exact same solution, on your own server, in your own hands. That is a claim that is unique, as far as I am aware. And you know that whatever you pay for the service never contributes to the development of proprietary software, but contributes to the state of the art in Free Software, available for everyone to take control of their own computing needs, as well as also improving the service itself. For me, it’s this part that truly makes MyKolab.com special. Because if you ever need to break out of MyKolab.com, your path to self-reliance and control is already built into the system, delivered with and supported by the service itself: It’s called Kolab. Following the disclosures about details on how the United States and other countries are monitoring the world there has been a global discussion about this subject that’s been long overdue. In previous articles I tried to put together what actually has been proven thus far, what that means for society, and what are the implications for businesses around the world. Now I’d like to take a look at governments. Firstly, of course governments have a functional aspect not entirely unlike business, and of course governments should be conscious about the society and values they promote. Purely on these grounds it would likely be possible to say quite a few things about the post PRISM society. Secondly, there is of course also the question to which extent governments have known about this previously and may even have colluded with what has been going on – in some cases possibly without democratic support for doing so. It has been pointed by quite a few journalists that “I had no idea” amounts to saying you have not been following technical progress since the typewriter was invented, and there is some truth to that. Although typewriters have also known to be bugged, of course. In fact when spending so much time at the United Nations, one of the typical sights would be a diplomat talking on their mobile phone while covering their mouth with one hand in order to ward off the possibility of lip readers. So there is clearly an understanding that trying to know more about anyone you may have common or opposing interests with will give you an advantage, and that everyone is trying to gain that advantage to the best of their ability. What I think is really at play here are two different things: Having been blind-sided by the actual threat, and having been found naïve. Smart politicians will now have understood their threat model has been totally off. It’s much easier to intercept that mobile phone call (and get both sides of the conversation) than it is to learn to lip read, guarantee to speak the same language and try and make sure you have line of sight. In other words: They were spending lots of effort protecting the wrong things while ignoring the right things. So there is no way for them to know how vulnerable they have been, what damage arose from that, and what will follow from that for their future work. So intelligent people should now be very worried, indeed. Because either they did not know better, or perhaps even let a sense of herd safety drag them along into behaviour that has compromised their professional integrity in so far as it may have exposed their internal thoughts to people they did not want to share them with. If you’ve ever seen how international treaties are being negotiated it does not take a whole lot of fantasy to imagine how this might be a problem. Given the levels of secrecy and apparent lack of supervision if highest level politicians truly had no idea, there is also a major concern about possible abuse of the system to influence the political balance within a country by those in government. The other part of the surprise seems to stem from a certain romantic notion of friendship among nations harboured by many politicians and deliberately nurtured by nations that do not share such romantic perspectives, most importantly in this context the United States. The allies of the United States, in particular also the European Union know that the US has these capabilities and is not afraid to use them to gain an advantage for the home team. But for some reason they thought they were part of that home team because the United States have been telling them they’re best friends forever. It does not lack a certain irony that Germany fell for this, not realizing that the United States are following their default approach abroad, which is commonly referred to as Realpolitik in the US. So when European politicians suddenly realize that it may be problematic to negotiate free trade agreements with someone who is reading your internal briefings and mails and is listening to your phone calls, it is not so much out of a shock that the US is doing this in general. They know the US is not shy to use force at any level to obtain results. It’s about the fact they’re using these methods universally, no matter who you are. That they were willing to do so against Switzerland, a country in the heart of Europe, should have demonstrated that aptly. Only that in this particular case, EU politicians were hoping to ride on the coat-tails of the US cavalry. Of course that surprise also betrays the level of collaboration that has been present for a long time. The reason they thought they were part of the home team is that in some cases, they were. So when they were the benefactors of this system as they worked side by side with the United States at the Intergovernmental Organizations to put in place the global power structures that rule the world, this sort of advantage might have seemed very handy and very welcome. Not too many questions were asked, I presume. But if you’re one of the countries in transition, a country from the developing world, or simply a country that got on the wrong sides of the United States and their power block, you now have to wonder: How much worse are you off for having been pushed back in negotiation much further than if the “Northern” power block had not known all your internal assessments, plans and contingencies? And how can Intergovernmental Organizations truly function if all your communications with these organizations are unilaterally transparent to this power block? It’s time to understand that imbalance, and address it. I know that several countries are aware of this, of course, and some of them are actively seeking ways to address that strategic disadvantage, since parts of our company group have been involved in that. But too many countries do not yet seem to have the appropriate measures in place, nor are they addressing it with sufficient resource and urgency, perhaps out of a underestimation of the analytic capabilities. The PRISM leaks should have been the wakeup call for these countries. But I’d also expect them to raise their concerns at the Intergovernmental Organizations, asking the secretariats how the IT and communications strategy of these organizations adequately protects the mandate of the organizations, for they can only function if a certain minimum level of confidence can be placed into them and the integrity of their work flow. But on a more abstract level, all of this once more establishes a trend of the United States as a nexus of global destabilisation subject only to national interest. Because it is for the US government to decide which countries to bless with access to that information, and whose information to access. Cooperate and be rewarded. Be defiant and be punished. For example by ensuring your national business champion does not get that deal since we might just employ our information to ensure our competing US business will. This establishes a gravitation towards pleasing the interests of the United States that I find problematic. As I would find a similar imbalance towards any other nation. But in this case it is the United States that has moved to “economic policy by spook” as a good friend recently called it. Although of course there may be other countries doing the same, as right now it seems more or less confirmed this is at least in part collusion at NATO level. Be that as it may, countries need to understand that their sovereignty and economic well-being is highly dependent upon the ability to protect your own information and that of your economy. Which is why Brazil and India probably feel confirmed in their focus on strategic independence. With the high dependency of virtually any economic sector, Information Technology has become as fundamental as electricity, roads or water. Perhaps it is time to re-assess to which level governments want to ensure an independent, stable supply that holds up to the demands of their nation. Estonias president recently suggested to establish European cloud providers, other areas of the world may want to pay close attention to this. The Opportunity Exists, Does The Will? Let’s say a nation wanted to address these issues. Imagine they had to engineer the entire stack of software. The prospects would be daunting. Fortunately they don’t have to. Nothing runs your data centres and infrastructures better, and with higher security than Free Software does. Our community has been building these tools for a long time now, and they have the potential to serve as the big equalizer in the global IT power struggle. The UNCTAD Information Economy Reports provide some excellent fact based, neutral analysis of the impact of software freedom on economies around the world. Countries stand to gain or lose a lot in this central question. Open Source may have been the answer all along, but PRISM highlighted the need is both real and urgent. Any government should be able to answer the following question: What is your policy on a sovereign software supply and digital infrastructure? If that question cannot be answered, it’s time to get to work. And soon.